I experience much joy expressing my ideas and passions through my art. I am always surprised at the result as I am working spontaneously, focusing on the process as opposed to working for a particular outcome. In my recent work, I am enjoying the playfulness I experience when making my whimsical animal watercolors and my mixed media/collages. Recently, in my spiritual searching and exploring, I have been breaking apart the ideas and meanings that I have given to myself and this world. I am allowing myself to let these ideas go and become open to new possibilities and ways of seeing. I am applying this same process with my mixed media/collages where I break up images and shapes, add colors and lines, move them around and allow the energy to flow. The joy of this new openness is expressed through both my mixed media pieces and my imaginary animal watercolors. Marlaya Charleston has been drawing and painting since the age of twelve. She began her formal training at the age of sixteen at The Art Students League in New York City. Growing up there, she had the privilege, at a young age, to visit the Modern Museum of Art, The Metropolitan Museum of Art and The Guggenheim Museum where she was moved and inspired. She continued her studies in New York at Parsons School of Design, Cooper Union and eventually earned her Bachelor of Fine Arts Degree from The School of Visual Arts. Her influences are African Art, The German Expressionists, Picasso and Matisse. In her latest work, Marlaya continues her artistic exploration by making compositions combining realistic images with abstract shape, texture and color and whimsical animal watercolors. 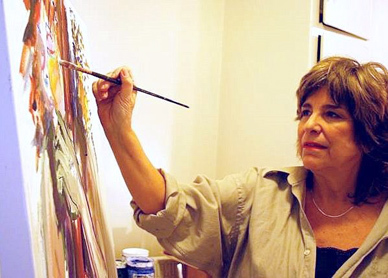 Her works have appeared throughout the Los Angeles area and are collected internationally. Parsons School of Design New York, N.Y.
Cooper Union New York, N.Y.
Art Students League New York, N.Y.
© 2004-2019 Marlaya Charleston. All Rights Reserved.